J.D. Fortune (born Jason Bennison on September 1, 1973) is a Canadian rock singer and songwriter. 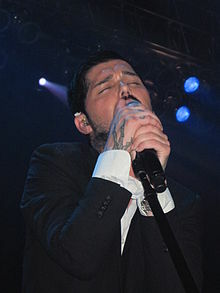 He was the winner of the 2005 CBS reality television series Rock Star: INXS, and fronted INXS until August 2011. Being part of a rock band takes a lot of energy. That is one reason I became a vegetarian. I feel better physically, I have a lot more energy and I feel better emotionally knowing that I am not contributing to the suffering of animals worldwide. Remember, every time you sit down to eat you have a choice to make. I hope you choose to make a difference. “J.D. Fortune GoVeg.com Public Service Announcement,” video ad for People for the Ethical Treatment of Animals (16 July 2008). This page was last edited on 17 August 2018, at 00:41.